Recall that a median of a triangle is a segment that connects any vertex to the midpoint of the side opposite that vertex. Since a triangle has 3 vertices, it has 3 medians. 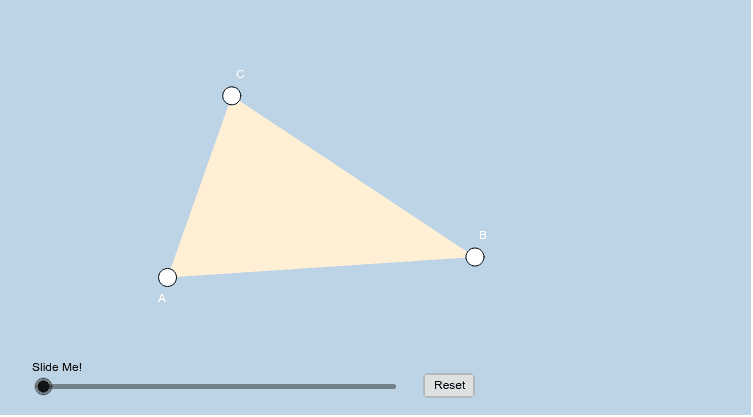 This applet will illustrate 2 very special properties about a triangle's 3 medians. Interact with it for a few minutes, then answer the questions that follow. Note: The BIG ORANGE POINT that will appear is known as the CENTROID of the triangle. Have fun with this! Be sure to change the locations of the triangle's BIG WHITE VERTICES each time before re-sliding the slider.